Mold is unsightly and smelly and you don’t want it hanging out at your home. More than that, it can cause serious damage. It eats away at wallpaper, drywall, carpet, wood, tiles, floorboards, and left to its own devices, it can destroy your home. But even more than that, mold is hazardous to your health, from the annoying stuffy nose to life-threatening medical conditions for those with compromised immune systems. Mold could cause serious problems and should be taken equally seriously. If you suffer from any neurological symptoms like a short attention span, dizziness, headaches, memory loss, or have trouble concentrating, it could be a huge red flag that harmful, toxic mold is growing and continuing to spread throughout your home – and it’s literally poisoning you. It doesn’t matter if it’s visible mold or not. Enough mold to cause health problems is a problem no matter what. Just like allergies, if you or your family’s toxic symptoms increase when you’re at home, you can almost be sure your home is carrying mold. Don’t wait; take action immediately before risking both the health of your home and family gets too far out of control, especially if you have children. Don’t let mold make itself at home in your house. As sneaky as it is, there are signs. Learn to read those signs, and you can kick the mold out before it becomes a major (and expensive) problem. You often smell mold before you see it. Like a skunk. Or the coworker with the cheap cologne. The odor is due to the gases that mold releases into the air. It may differ depending on the species of mold, but it is always unpleasant. It’s hard to describe (musty, earthy, acrid), but once you smell it, you won’t forget it. Curious? Next time you do the laundry, leave the wet clothes in the washing machine. You have started sneezing; your nose is running; your eyes are red; maybe there’s a rash that has popped out on your skin. Allergy season? Coming own with a cold? Could be—unless the symptoms only occur when you are home. Then you can bet that there is mold lurking somewhere. It’s a notorious allergen. Even if you don’t know exactly which species of mold you are looking at, you know it’s mold. What else so ugly and foul would be growing in your home? It may be dark splotches, fuzzy lumps, furry patches, thread-like strands or specks. Sometimes it wears the disguise of everyday household dust or soot. It can be black, white, orange, gray-green, olive-green, brown, yellow or blue or a combination thereof. You might see paint or wallpaper that is bubbling, cracking or peeling, and walls that are warped, bulging or bowed. 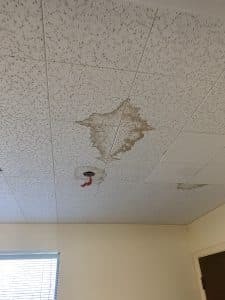 There may be dark rings or spots on the ceilings or walls. Any of these things could be due to mold behind, under or above the damaged areas. Condensation, frequently found on windows or dripping from pipes, means that you have a great deal of moisture in your home that is, or will soon be, a fertile breeding ground for mold. Check window sills for pools of condensation that have seeped into the wood frame, and pull out the refrigerator drip pan that collects condensation—both favorite spots for mold. The chances that mold developed during those incidents is very high. And it developed in unusual, unexpected places where it is escaping detection (beneath flooring, above the ceiling). Don’t let the mold lay low. It is most likely at or near the place where the water problem originated. Mold sometimes hitches a ride into your home on decorative plants. It’s fairly easy to spot—a white chalky substance on the leaves. At first, the white spots are circular, then the mold spreads and the entire leaf is covered, and then the entire plant with the fluffy white mold. Once you have found the mold, do not touch it. Mold spores will latch onto anything they can. You don’t want them on your skin or in your lungs. Call in the mold inspection and testing professionals AWA Environmental at 1-713-401-9751 to determine exactly how dire your mold situation is and advise you how to proceed. Great information. I had no idea about looking for mold on the decorative plants in my home.